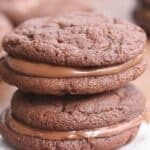 Thick and chewy chocolate Nutella Cookies made into a sandwich cookie with Nutella in the center. When the weekend comes and I allow my self to make a treat, I usually always fall back to cookies or bars of some kind. Probably because they’re easier to make small batches of and I like to freeze the leftovers. 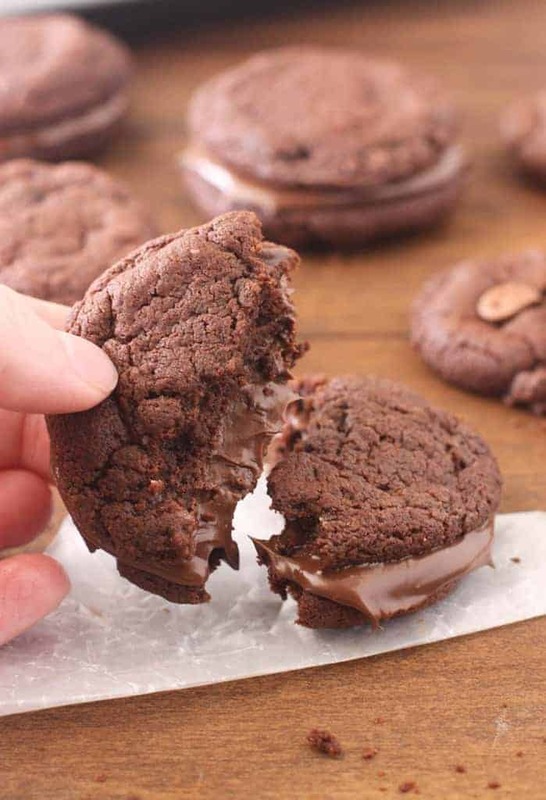 These Chocolate Nutella Cookies freeze beautifully by the way. 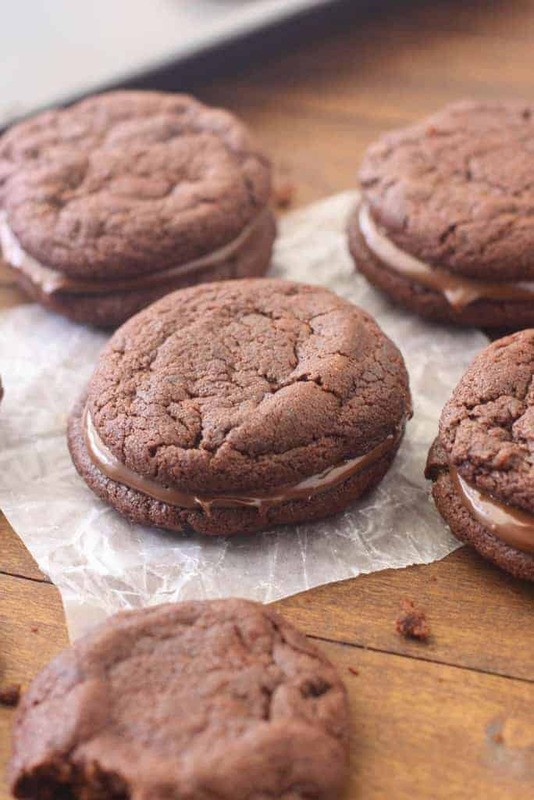 These Chocolate Nutella Sandwich Cookies catapulted me into cookie heaven. The cookies alone are amazing–thick and chewy with the perfect hint of Nutella. Sandwiched together they’re basically irresistible. 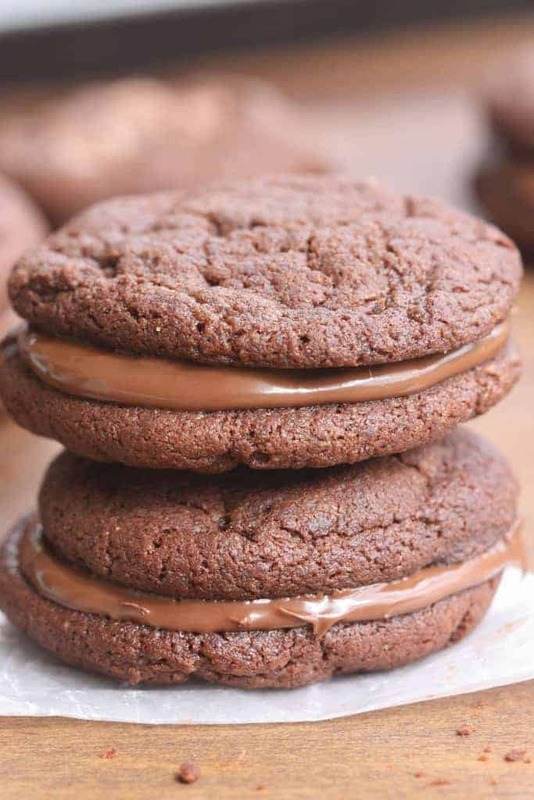 Thick and chewy chocolate sandwich cookies with Nutella in the center. Preheat oven to 325° F Add flour, cocoa powder, and baking powder to a mixing bowl and stir to combine. In another mixing bowl beat together butter and sugars for 2 minutes until smooth. Add vanilla and nutella and mix until smooth. Add half of the flour mixture and mix until combined. Add the milk, mixing until combined. Then add the remaining flour mixture and mix until combined. Cover well and refrigerate the dough for at least 15 minutes or overnight. When ready to bake roll dough into tablespoon size balls and place them on a baking sheet lined with parchment paper. Lightly press the dough balls with the bottom of a drinking glass to flatten them a little. Bake for 10 minutes. Remove from the oven and allow them to stand for 5 minutes before transferring them to a cooling rack and allowing them to cool completely. Once cool, spread a spoonful of Nutella onto a cookie and top with another to make a cookie sandwich. Store extras in an airtight container for a day or two. To freeze (they freeze really well! ): Once cooled, place the individual cookies in a ziplock freezer bag. When ready to eat, remove them from the freezer and allow to come to room temperature. Then spread Nutella in between two cookies and sandwich them together.